Nigeria’s Department of Petroleum Resources admitted on Tuesday that no due diligence was carried out prior to the awarding of Oil Prospecting Licence 245 to Malabu Oil in 1998. The oil block, considered the richest in Africa, is estimated to contain about 9 billion barrels of crude. The licence was awarded during the regime of a former military dictator, Sani Abacha, under the supervision of then Minister of Petroleum, Dan Etete. PREMIUM TIMES had reported how Mr. Etete, using a fictional character Kwekwu Amafegha, owned 30 per cent of Malabu at inception in violation of Nigerian laws. The other shareholders were Mohammed Sani, Mr. Abacha’s son (50 per cent) and Hassan Adamu, a former Nigerian Ambassador to the U.S. (20 per cent). 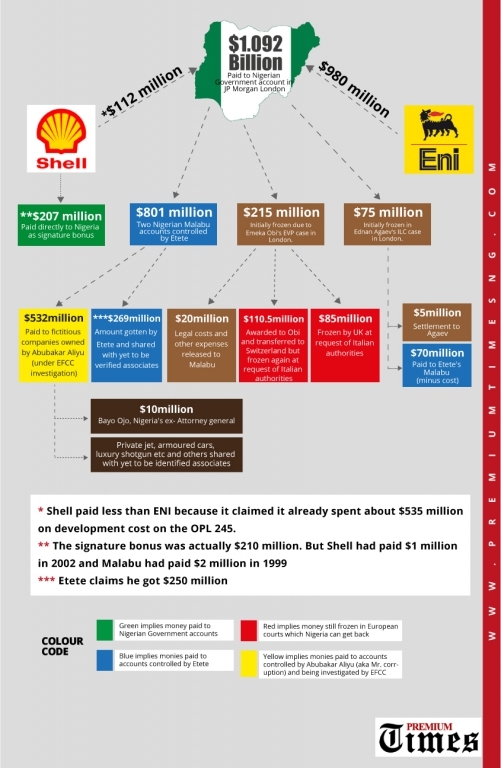 After years of controversy that saw OPL 245 changing hands between Malabu, the Nigerian government, and oil giant Shell, the Nigerian government received about $1.1 billion through an escrow account with JPMorgan from Shell and another oil major, ENI, for the block. The government then transferred majority of the funds to accounts controlled by Mr. Etete in a suspicious deal that has been a subject of sweeping investigations across four jurisdictions. At a resumed hearing on the controversial deal by the Nigerian parliament on Tuesday, Joseph Tolorunse, the Director of Legal Services at DPR, said the regulator only took instructions from ‘top level’ government functionaries when the block was originally allocated. Mr. Tolorunse said his department only confirmed payments for the licence but didn’t participate in the process leading up to the selection of Malabu Oil as the recipient of a prospecting licence for the lucrative oil field. Mr. Tolorunse said he was only able to confirm that Malabu Oil paid N50,000 as application fee to the government at the time. The firm also paid $10,000 for the processing of bilateral investment terms. However, the $20 million that was meant for signature bonus was not paid by Malabu. Instead, the firm paid about $2 million in advance fee and later gave the government a cheque for the $18 million balance which failed to clear. The alleged sharp practices, as well as political interests in the block, led the Olusegun Obasanjo government to withdraw the award of the oil licence from Malabu in 2000. It was later allocated to Shell via a selective bidding process between 2001 and 2002, before it was later withdrawn from the oil giant, also by the Olusegun Obasanjo administration. The Nigerian government later in 2009 brokered a fraudulent deal that led to the transfer of the oil block to Shell and ENI with the oil majors paying about $1.1 billion through the federal government to Malabu accounts controlled by Mr. Etete. 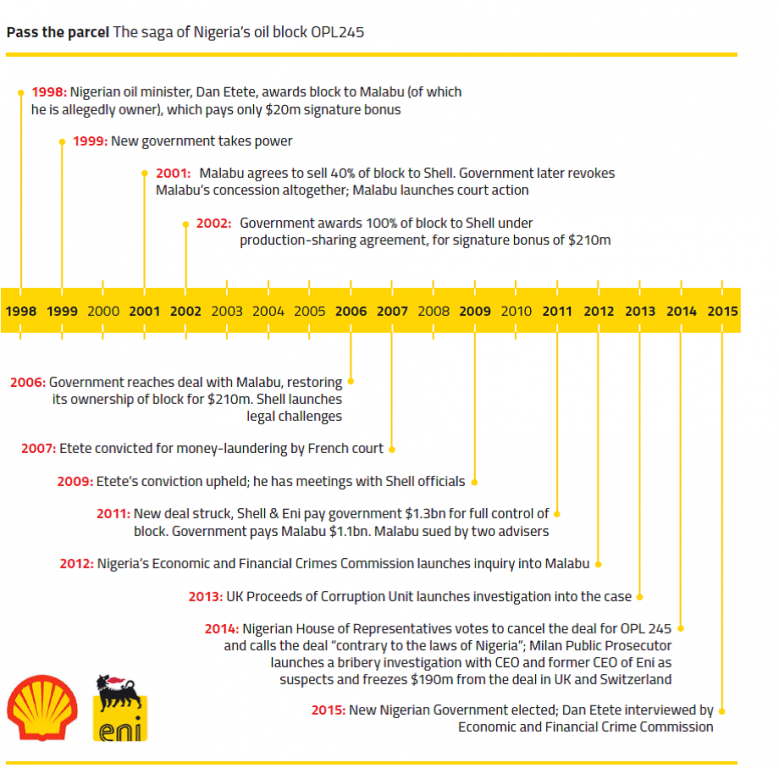 Although Shell and Agip had long maintained innocence since the fraud was first uncovered, PREMIUM TIMES investigations as well as a leak of internal emails of the companies later indicated their involvement.